Happy Birthday To You! And Many Happy Returns! 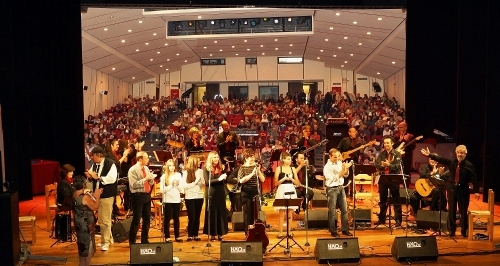 Mytilene's Municipal Council's Orchestra celebrated its 30th Anniversay in grand style at the Dimotiko Theatre, Mytilene. Above: Encore! Encore! Conductor, Nikos Tsirigotis pays tribute to the Orchestra. Above: And the song goes on and on and on.... Members of the Orchestra temporarily put down their musical instruments and let their voices fly as a choir. Above: Mayor of Lesvos, Dimitrios Vounatsos, presents the Orchestra- represented by its Conductor, Nikos Tsirigotis, with a commemorative plaque. Above: Various photographs from the Concert.